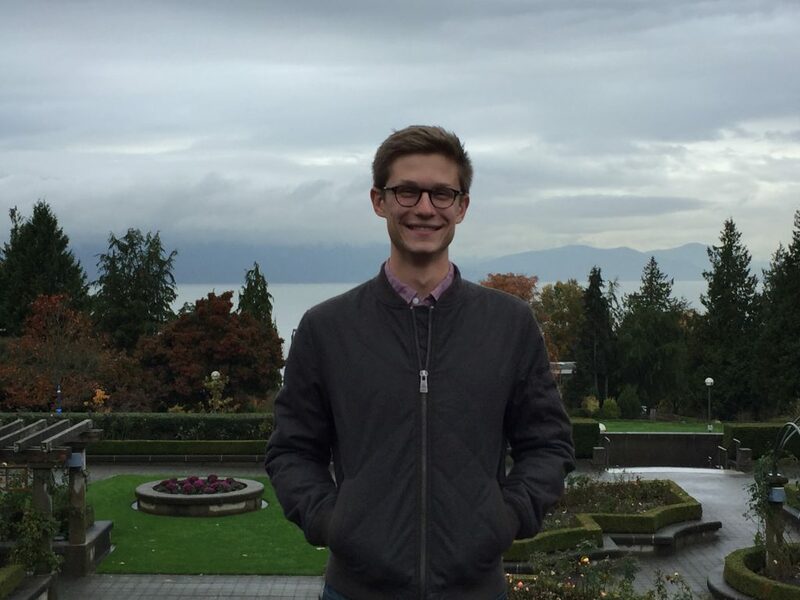 Geothink’s former Project Manager, Alexander Taciuk, has just begun the next step of his career in Vancouver. Geothink caught up with him to find out where he has been and where he is headed. What have you been up to since you left Geothink? I went on a three month trip around the world. Southeast Asia for a couple of months and then Europe for a month. Saw everything I could see, explored cities, ate everything that came across my plate, to varying results. Now I have just started my studies here in Vancouver, at the School of Community and Regional Planning at the University of British Columbia. I learned so much at Geothink, there were times that it was intense, and it was all a wonderful experience. What made you decide on a degree in planning? I’ve toyed with the idea for a long time. It’s part of why I did a degree in urban geography at McGill University. The time that I had in Geothink gave me the chance to actually speak to a lot of city officials and Geothink partners, and see what they do. That reinforced my desire to work in a municipal field, work with citizens, and find ways to make government and citizens coexist in a productive and harmonious way. The decision to go into planning really came about during my time in Geothink, and so far I think it has been the right decision. Did Geothink help shape your views on the urban planning issues most important to you? Yes. One of my personal interests is in transportation. Although transportation issues didn’t represent themselves heavily in Geothink, it was always exciting to hear about work on transportation. It was really cool to hear about Prof. Scott Bell’s work on voluntary cellphone tracking in Saskatoon and what he found when buses went on strike in the middle of their experiment, which produced a sort of natural break [in transportation flows]. Would be able to bring what you’ve learned from Geothink, such as open data and open government, to your new field? Absolutely. I think that being able to learn about open government, open data, crowdsourcing, and smart cities, the various urban issues discussed in Geothink will add a lot of richness to my new degree. Hopefully I’ve gained enough to create more nuanced views of urban planning issues, which I can convey to planners. Geothink has also looked at city-to-citizen interaction. Do you see yourself working towards improving these efforts in urban planning from what you’ve learned here? I hope so. I think that the work that Geothink has done on public consultations and citizen participation could add a lot to what we are doing in the planning world. One of the classes I’m in, called Planning Practices and Methods, is about learning a toolkit on how to solve multi-criteria, multi-stakeholder, very complex problems. You learn how to come up with objectives for them, develop alternatives, and when you need to ask the public a ‘value’ question or when you need to bring in technical experts. I already see some parallels with Geothinkers’ research such as in Spatial Decision Support Decisions. To have public consultations on issues to develop what the public thinks their values are, and not just do that from face-to-face meetings, but to be able to do that digitally in a constructive way, that is the value that Geothink could bring to planning. Are there any skills you learned while at Geothink that you are bringing forward? There were a lot of soft skills I learned in terms of organisation, connecting with people, and trying to bring people onboard with new ideas that they may not yet see a connection to. The events that I really enjoyed doing were the Summer Institutes, I absolutely loved them, there were points during them where I couldn’t believe that this was my job. I learned a lot about organising events, and seeing things run smoothly, students coming in and actually getting something out of it, such as the one we did last year where the students were consulting for the City of Ottawa – learning how to create that was such a great process. What was the best experience you had at Geothink? What will you miss the most? I’ll miss the people in Geothink. No government mandated that we need to study open cities or open government. It was a bunch of professors, and partners, that came together and said ‘hey this is a really good topic and something we should investigate’. So they just did it. And so being able to get on the phone and speak with academics and research partners from around Canada and hear about the work they are doing – that was really great. I had a lot of conversations with Prof. Jon Corbett where we discussed his projects and various ways of doing them, and just having the opportunity to be that sounding board was a fantastic experience. That’s what I’ll miss. I like to say a huge ‘thank you’ to Dr. Renee Sieber. I learned a lot under her mentorship, and it was great working under her. I also want to give a big thank you to all our researchers and partners for allowing me to work with them. I am confident that we will continue to get brilliant output from you all, and am incredibly excited to see how Geothink progresses in its final stages. This entry was posted in In The News and tagged Alexander Taciuk, Vancouver on October 27, 2016 by Geothink.